Chopin – A Passionate Quilter – Page 2 – I love to share my Quilting projects with other Quilters. My goal is to share my progress on projects that I am working on. I would love for you to follow along with me during my endeavors. I hope you enjoy watching me tackle new techniques and projects. Hopefully you can learn from my "hiccups" and mistakes and make your journey easier. This is my 300th post since I began Blogging in 2014! I am working on Marsha McCloskey Star of Chamblie at this time. I have 9 blocks to make and have finished 3 and 2 more ready to sew! I am becoming more comfortable in the cutting and sewing of the very technical and complex blocks. I am using Moda Marble Mates Blue and remaining fabrics from Marsha’s website. The only thing I do not like doing a post on my phone is not being able to provide a link to my earlier posts. Please check out my beginning post on 3 March for more of the process. Greetings from South Texas where it should be March, but think Mother Nature is confused!!! 29 This morning and now just 47, but we have sunshine! Nice day, for staying inside and quilting! I have been working on the Stars for the middle block of my Feathered Stars. BOY! What a job in cutting, but I have it down pat now! Thank Goodness! Those 1/16″ cuts added to a normal cut is a killer – even with notes! I will have 4 Blue Stars for the corner blocks, and 4 White Stars for the remainder of the blocks. The first block I made will be my center block. I am going to start making the feather part now for these 4 blocks, then I will make the remaining 3 white stars and make the feathers for them! I am so excited now that I chose this as my next project. Stars measure at 6 1/8! Today, just at the right time, I received the order of fabric from Marsha McCloskey to finish my quilt. I love this fabric made by Clothworks – it is a dream to work with and so soft! Marsha McCloskey fabrics in Blue! I ordered another piece from Marsha that really grabbed me! It is from Sharon Yentor In The Beginning fabrics called Floral Bouquets and Fancies! Beautiful! The color is a vibrant red – I do not know why it is not showing up as such, but its a beautiful piece to work with on another project! Time to get back to cutting! I am so glad that I purchased Marsha’s ruler a long-long time ago. It is really a must if you ever make one of her Feathered Stars! REALLY? FUN? Well, let’s say challenging! I am in the process of driving myself completely nuts! But this is so much fun to start on a quilt where you learn by doing! I was successful in making the first of nine (9) Feathered Stars and so happy! The remainder of pattern calls for 5 Stars in the center of each feathered star center and has other 6 and 1/8″ blocks that can be used in the remaining 4 stars. Yesterday I decided that I would make 8 stars out of different fabrics from Marsha McCloskey Star of Chamblie for my centers rather than just using a fussy cut square in the middle of the stars (easy way to a finish)! As a test case I made one star using her cutting instructions only to find out that this could be a wrong decision because I could not reach a 6 and 1/8″ square star. So I went back to the decision to just do the ‘easy thing’ and fussy cut squares for the center like I did on my first block! Yet this morning when I woke up I realized I just could not give in to that temptation of taking the ‘easy way’ out and all of a sudden the light bulb went on! What was my problem, since when did I EVER follow the exact cutting instructions stated on a quilted pattern! I always cut larger and trim to size! Why not now??? So I proceeded to cut out the 4 corner squares at 2″ rather than 1 and 15/16″, cutting the center square as stated, and rounded the Flying Geese cuts up by 1/16″ and YEA IT WORKS! I can square the extra off the Flying Geese by matching up to the 4 1/8″ star center! Squaring was the problem with the block I made yesterday, but today, it came out a perfect 6 1/8″ square! It just does not get any better than this. One would not think that it would make a difference but it does. I had to square my first block at 6″ and pray I could fudge! Now I won’t have to! Perfect little star. I am thinking that I will make the remaining 8 today as they go pretty fast. Moral of the story! Do not shy away from experimenting with the Designer Instructions! Additionally, I was asked about the way Marsha does the bias HSTs. For this particular pattern, it works great because there are no issues with the critical HSTs used in the feathered star portion of the block. I might consider using this system when I make OMIGOSH! It might take a little longer, but to be able to cut the small HSTs without problems, it will be worth it! You all know how much I hate Mondays as there is always something thing that comes my way that I just do not want to deal with! Today is no different as in the mail our house insurance company has now sent a new “Star Package” with a little higher price for me to read! I glanced it over, put it back in the envelope, and decided to contact our Agent and let her tell me what the changes are and the impact on us. I think I decided to do this when it mentioned “up to $250.00” for a mailbox that was damaged! WHAT we do not have a mailbox in the country – we have a cluster of boxes about a mile from the house. Why should we pay to have this in our policy! Grrrr! I leave you with the thought that you have a great week! I will as I have some time before I deal with insurance companies! I am working on the last 2 blocks for A Bountiful Life. There are a total of 20 blocks, but I have become bored and uninterested in the project and am anxious to get it into a flimsy and ready to quilt (someday)! I am hoping to finish this by next week (I only do hand work at night). I love WordPress! I can start my Post on my iPad and finish on my iPhone! Spoiled am I! This Hand Quilt Along is an opportunity for hand quilters and piecers to share and motivate one another started by Kathy. We post every three weeks, to show our progress and encourage one another. If you have a hand quilting project and would like to join our group contact Kathy at the link below. Happy March! Winter is evidently going to hang around a little long this year! I love the cold weather so I will enjoy the next week and I do hope that hot weather does not come early. We are in another drought and really need some heavy rains to catch up. My friend Gretchen reminded me that in a week we will be on DST – UGH! Not my favorite thing at all! I am back to normal and thankful for it! I still cannot figure out how or why this episode came about! Thank all for the concerns. But it is over and I finished my first Feathered Star block. I am making the Star of Chamblie by Marsha McCloskey. The instructions are complex and this quilt will be a great challenge project. Marsha uses cuts such as 1 9/16″ and 1 15/16″ so if one is not familiar with a tape measure there could be a big “WHAT” when cutting the pieces. I have used a 1/16″ extra cut on some things, but when I bought the book I also purchased her special Feathered Star Ruler that has the extra 1/16″ indicated. In 2013 I made a Radiant Star from one of her books but that was 6 years ago and who remembers those instructions! Now having made a second star using her method, the remaining will be much easier (Really Nanette?). It appears that her philosophy is that whatever size your block turns out to be is fine. As long as I am precise in the cutting and labeling and studying the directions I will be fine. I do believe it will be easier than York Lodge. Marsha uses the bias strip piecing method to make the 1 1/2″ HSTs and this process yields absolutely perfect HSTs. I had purchased the fat quarters for the background from her fabric collection in 2013. I have ordered some additional fabrics to complete this project. Here are some pictures of the process I went through to understand and make sure that my block would turn out accurate. Directions – WOW! A Puzzle, but once understood they are great! The Star pieces all cut, labeled, and ready to sew! Decision Point – Which Center to use! And the final Block! I am pleased! 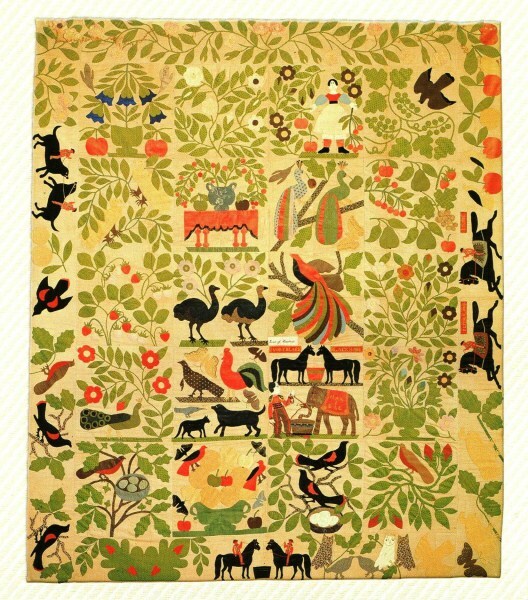 I am going to enjoy making this quilt! It is challenging, rewarding, and learning new techniques. There are parallelograms, HSTs, accurate piecing, points, and a very accurate 1/4″ seam allowance involved in making a Feathered Star! More learning!